We had a few friends over last night and drank champagne at midnight. 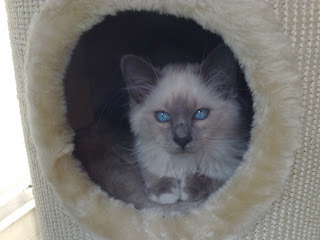 Usually I go away on my birthday, but because we just got the cat we decided to stay in town. And I got tagged twice more! I was on my birthday trip to Poland and on the 31st we were in Wroclaw and stayed in the same hotel Hitler always stayed in on his visits. They saw it was my birthday in my passport and brought me little cakes to my room! I'm not going to tag anyone this time, but feel free to do it if you want! I've been tagged by the boston bibliophile. Margaret Atwood is reliable for a great read. Handmaid's Tale, Alias Grace and The Blind Assassin are top tier. I also liked Robber Bride and Cat's Eye. Joyce Carol Oates is very prolific it seems that she's an endless source of reading material. Some favorites are Them, Blonde, Foxfire, Black Water, and her short stories. I always enjoy Douglas Coupland. I have read most of his fiction novels with Miss Wyoming, All Families are Psychotic and Hey Nostradamus being my favorites. The new one, the Gum Thief sounds cool. Daniel Handler (aka Lemony Snickett) is awesome. The Series of Unfortunate Events is exactly my humor, though the series kind of lost steam by the last few books. Sebastian Japrisot - Most of this French author's noir thrillers are now out of print (The Lady in the Car with the Glasses and a Gun, The Sleeping Car Murders, One Deadly Summer and my favorite Trap for Cinderella) but if you can find them they are well worth a read. He also wrote A Very Long Engagment which I enjoyed very much. My favorite book as a child was an abridged illustrated version of Last of the Mohicans. So I think I thought J. Fenimore Cooper was my favorite author. I haven’t read any of his other work, though. Lately I've been really into David Mitchell. 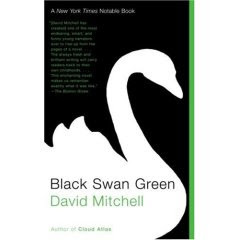 Ghostwritten and Cloud Atlas are genius and I liked Black Swan Green. And Scott Westerfeld really impressed me with the Uglies series, so looking forward to checking more out from him. Barbara Kingsolver - Prodigal Summer and Poisonwood Bible are favorites and though I didn't like the Bean Trees much and thus won't be reading Pigs in Heaven, I would check a new novel from her. I love Jasper Fforde's Tuesday Next series but I haven't read any of his standalone books. Rules: Link to the person that tagged you, post the rules somewhere in your meme, answer the questions, tag six people in your post, let the tagees know they’ve been chosen by leaving a comment on their blog, let the tagger know your entry is posted. How many books do you have cataloged in your LibraryThing account? How do you decide what to include- everything you have, everything you've read- and are there things you leave off? Well, I currently have 364 books in my LT library. These are only the books I have gotten around to entering. The first books I entered were all the novels that I've read in the last 5 years (because I've kept a list), then all the 1001 Books to Read before you Die that I've read and then most of my writing non-fiction and dystopian fiction books. I still have to enter most of my design and art books, most of my children's picture books, and various other non-fiction titles. I will never be able to enter all the titles that I've ever read. I usually do not enter a book until I have read it (those marked TBR are actually in my TBR stack or they are signed by the author), but I do not discriminate against books that I borrowed from the library or friends or those which I no longer have because I've donated them. As far as leaving things off, I will probably never enter all my Lonely Planet guidebooks or my ton of foreign language learning guides. Oh, and I just wanted to mention that my husband and I are celebrating our 2nd wedding anniversary today! We are going out to Higematsu - a delicious but pricey Japanese restaurant downtown. Definitely not as exciting as last year when we were in Africa, but at least we have a cat, right? 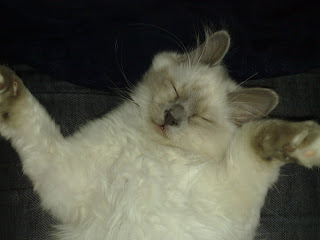 Here is a funny picture of Emmy getting her fur brushed this morning - enjoy! Now that school shootings are sadly almost commonplace, it is a topic that seems to come up quite a bit in literature as well. In the past few years I’ve read fiction told from a judge/mother of victim’s point of view where the shooter was mercilessly bullied (Jodi Piccoult’s 19 Minutes), a black comedy in which the shooter’s best friend is demonized by the press and stalked by a greasy opportunist cameraman named Lally (DBC Pierre’s Vernon God Little), one in which the main character is accused of threatening to shoot up the school (Joyce Carol Oates’ Big Mouth and Ugly Girl) and one in which the first section is narrated by a shooter’s victim from the great beyond (Douglas Coupland’s Hey Nostradamus). We Need to Talk About Kevin is a series of letters written by Eva, the mother of school shooter Kevin to her estranged husband. I don’t want to go too much into plot, except to say that I went in with a minimum knowledge (son shoots up school and mother and father are somehow not together anymore so mother writes letters to him about the son) – and I was continually surprised by the narrative. The novel has been criticized as being “overly literary” (yes there are “big words”) and “implausible” (if truth is stranger than fiction, is this fiction stranger than truth?) but you can’t say it’s predictable. Many also criticize Eva, saying she’s cold and unsympathetic toward Kevin. I actually quite liked her. She’s articulate, well-travelled and a successful businesswoman. And Kevin (to hear her tell it) is a psychopath from the moment he is born - “disgruntled”, “inert” and with a head that “lolled away in distaste” when offered her breast. And it doesn’t get better from there. He terrorizes fellow children, can’t be punished because nothing interests him, and is antagonistic towards his mother his whole childhood. Oh, and he kills a bunch of his fellow classmates at 15 because he thinks they are annoying. The story explores the questions: How do you love such a child? Can you even help such a child? Whose fault is it when a child engages in such a violent act despite a normal upbringing? Certainly none of these are easy questions to answer. This would be a great pick for a book club discussion. For the second edition of Library Thing Tuesday (which is now officially called Tuesday Thingers), we were asked about discussion groups. Specifically: "Do you belong to any (besides Early Reviewers)? Approximately how many? Are there any in particular that you participate in more avidly? How often do you check?" If we are talking about book discussion groups, then I'd have to say there are about 5 I check on a regular basis (LT Early Reviewers, LT YA Lit, BookDivas, B&N, RB). I also have stored about 30 book blogs in my favorites that I check 2-3 times a week to see what's new. I love leaving comments and entering contests. I even won my first contest over at Reviewer X's blog (which I love!) - a copy of Confessions of a Triple Shot Betty by Jody Gehrman (which already came). I also won a cherry phone charm at Linda Gerber's online launch party (what a great idea!) to celebrate the debut of her book Death by Bikini (looks like a fun read). Do you enter online contests? And if so, have you won any? Megan is giving away an ARC copy of Otherspace by David Stahler, Jr if you give her a suggestion of a book to read by May 31st. CONTEST ENDED. Devourerofbooks is having a contest to celebrate her 100th post. Leave a comment telling her which of any books she's reviewed you'd like to receive by June 18th. CONTEST ENDED. Bookroomreviews is giving away an ARC copy of Broken Angel by Sigmond Brauwer (christian dystopia - sounds exciting!) and Mrs. Perfect by Jane Porter. 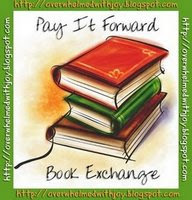 Just post this Pay it Forward icon on your blog by May 30th and leave a comment. CONTEST ENDED. Lori is also doing a Pay it Forward giveaway of 5 brand new books. Enter by May 30th by leaving a comment. CONTEST ENDED (and I won - YAY!). Bookshipper has her own Pay it Forward of an ARC of The Flirt by Kathleen Tessaro. Leave a comment by May 30th! CONTEST ENDED. Yesterday Tracy and I met at 6 pm at our favorite sushi place (Sushi Boy across from the English movie theater on Eschenheimer Landstrasse) where we indulged in their otherworldly sushi (seriously, it is like crack sushi). Then we went to Annie Proulx's reading at the Stadbuecherei (public library). She read from a new short story about a guy in a retirement home in Wyoming (didn't catch the title) for about 50 minutes, but didn't finish the whole story. It was quite entertaining as she does different voices for the characters and the story was infused with a lot of humor. Afterwards she answered a few questions. One guy said he just had to know what happened to Jack Twist (in Brokeback Mountain) because it didn't think it was clear enough. Her answer: "Readers have to contribute a certain amount to the story", followed by silence. She also said she begins stories by thinking about place - that characters and character motivations are all dictated by place. She claims she never gets inspiration for characters from real people that she's known, which Tracy finds impossible to believe. We both got our copies of Close Range and Other Stories (with Brokeback Mountain) signed and then headed home. Emmy rushed out the door and ran up the stairs when I got home. She was so wild that she lost her footing on the banister and fell about 9 feet. I was so freaked out that she was seriously hurt. But she limped for like 5 steps and then was back to her old self. I read that cats bones are only a bit less flexible than rubber and can survive falls from 10 stories. But I will probably take her to the vet Monday to be on the safe side. Thank you all so much for your comments! I really enjoyed reading about all the great things that are going on in your lives - not to mention your awesome book recommendations, exotic vacation destinations, and dreamy dream jobs. I was most amused by Carolyn's answers - she obviously knows all about my former Kit Kat obsession - not that it gave her any extra advantage with my kitten Emmy who did the drawing for me (and yes, she's capable - she plays fetch with quarters after all...). The winner of the $20 amazon gift certificate is.... zebracrazy82! This was so much fun, I will definitely have more contests in the future. So do stop by every once in a while, also just to see what's up and tell me more about what you've been reading! What attracted me to this book initially was the cover (I saw it at the Little Brown stand in Bologna) – doesn’t that frosted cookie look yummy? I also liked the jacket copy: “Sweethearts is about the power of memory, the bond of friendship, and the quiet resilience of our childhood hearts.” So yeah, not exactly high concept, but I like to read “quieter” books every now and then too. And this one was just lovely. High School Senior Jenna Vaughn has a cute boyfriend Ethan, tons of friends and seems to have it all together. But she still carries the scars of a solitary childhood – one in which her harried single mother didn’t seem to have time for her and she only had one friend – fellow outcast and first love Cameron Quick who disappears one day without explanation. When Cameron suddenly reappears years later, Jenna must come to terms with a traumatizing event in her past, confront her mother about her abandonment issues, and figure out what place Cameron, Ethan, and her new friends have in her life. I found the story and Jenna’s character arc to be very authentic. I have to admit, my first instinct was to scoff when I found out how relatively tame the “traumatic event” was – I mean it is very far from Cupcake Brown’s childhood as she describes in her memoir A Piece of Cake (I urge you to check it for a great true story of triumph over adversity). Upon further reflection, I realized that within Jenna’s scope of experience and from her narrow point of view, this one event was in fact earth-shattering. The writing is top notch throughout and I’d be hard pressed to come up with a last chapter that is more beautifully expressed than this one. This book really makes you think about how certain people have touched your life and left a lasting mark in your heart. 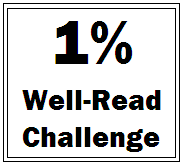 I finally found a reading challenge that I want to join - The 1% well-read challenge. I just entered all the 1001 Books I have read into my LibraryThing account and I am at 110! By the way, I have the book and think it is a fun read and a great way to find excellent books. When I ordered it, I had it sent to my friends Will and Sommer's place before my visit and Will just had to have it too. How many have you read from the list? Have you read any that I've included in my challenge? Being in London during the London Book Fair and not going to the fair started me on my online journey of finding places to get ARCs. One of the first places I found was Library Thing, who offer not yet published books for review every month in addition to being THE place online to catalogue your books (be careful, it's addictive!). So far I have snagged two books through the program (The Wednesday Sisters, which arrived in the mail already) and the 19th Wife (still waiting). Anyway, what LT also has is an active Early Reviewers book blogging community and we recently decided to do a ER theme post every Tuesday. This Tuesday is just about introducing ourselves. Thanks to the the boston bibliophile for setting this up! As my about me profile says, this blog is about books, travel, work and life. I mostly read high concept literary and YA fiction as well as the occasional sci-fi, thriller, and chick-lit novel. I also love to travel and have been to over 50 countries. 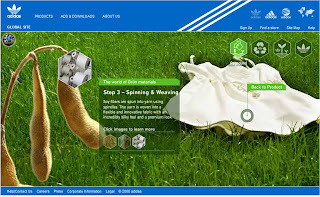 Several adidas Originals copywriting projects I have been working on are now online at http://www.adidas.com/ (then click on Originals). They are Handbags for Feet, Originals Games, and Gruen (a new line of clothing that is produced with innovative materials like soybeans, jute, hemp and bamboo and is meant to reduce environmental impact). Check them out! The Declaration is set in a world where a longevity drug has been developed that essentially lets people live forever. Sounds great at first - until you realize that if no one dies and people keep having children, population growth explodes and there just aren’t enough resources to go around. That’s why everyone who takes longevity drugs must sign a declaration saying that they will not have children. 15 year old Anna is an illegal and has lived in a “surplus” hall most of her life. She’s been told her parents broke the law by having her and indoctrinated by the cruel Mrs. Pincent to believe that her only chance to make things right is to be obedient and learn to become a “valuable asset” (otherwise known as a slave!). Her beliefs are shaken up when a boy her age who has lived on the outside all his life in hiding arrives and tells her “shocking things” about her parents and the declaration. As in most dystopian fiction, the main conflict is man vs society but we also have a well rounded villainess in Mrs. Pincent. In fact, Mrs. Pincent is actually a vastly more interesting character than Anna who comes off as fairly bland (granted it is due to her very limited life experience). The beginning of the book is slow with big lumps of exposition and lots of scenes showing just how very inhumane it is to tell children they are worthless. Things pick up when Anna decides it’s time to develop a personality and scenes with Mrs. Sharpe, a well drawn yet minor character are sharp and insightful. Even though the big twist is pretty obvious, it’s still satisfying. 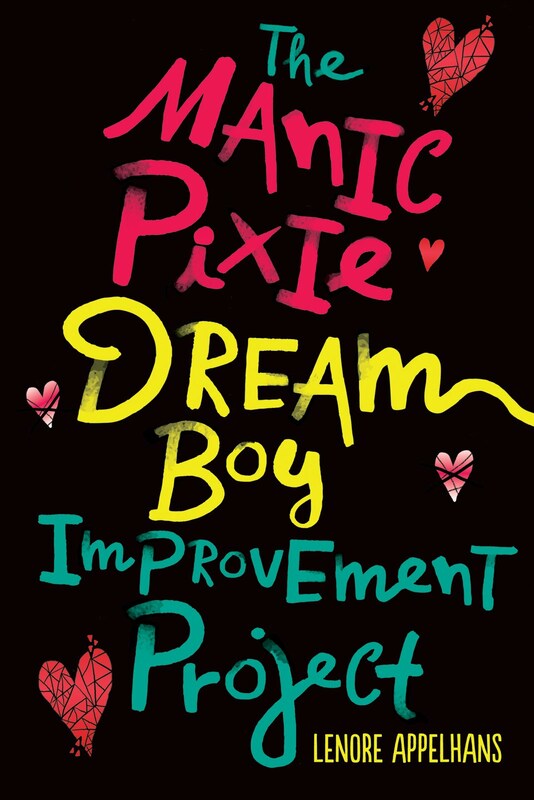 I had really high expectations for this book so I was a bit let down that it didn’t completely live up to them. Still, I would recommend it to my fellow dystopian fiction fans. 3. What was the best book you read recently? 4. What is something cool that happened in your life lately? You also get 1 extra entry if you blog about my contest and link to this post (and tell me that you did). The contest will end when I have 50 comments or on May 15 - whichever comes first. Good luck and thanks for helping me celebrate! That´s right! Penguin classics is giving away 1 copy of each of its 1400 titles to the first 1400 people who sign up. I signed up and got Thomas More's Utopia, rather ironic considering I am reading so much dystopic fiction lately. If you sign up, let me know what you get! UPDATE: Can't believe they're already out of books. Sorry Linda. Then we came to the End is by former advertising copywriter Joshua Ferris. That fact alone is a reason for me to read the book, because I like to support my fellow copywriter peeps. This book landed on Entertainment Weekly magazine's top 10 of 2007 book list and it has a unique conceit - namely that it is written in 1st person plural "we" for all of the book except a short interlude in the middle. In my work, I write in 3rd person plural nearly all the time - because companies want to appear friendly and inclusive - but using it for a narrative? That's difficult to pull off - but I happy to report that Ferris does. We are introduced to a creative team at a Chicago advertising agency who are all trying to look busy so they won't be the ones who fall victim to layoffs. The characters seem familiar to anyone who has toiled in an office - the practical joker Tom, the shy but sweet Benny who is in love with the loud-mouthed Marcia, the trendy overachiever Karen Woo, the depressed Janine, hysterical Chris Yop, loner Joe, Amber and Larry engaged in a "secret" office affair and Lynn, the boss who everyone is scared of, who becomes the heart of the story. As business becomes worse, characters start getting fired, though the story is not always told in linear fashion, but rather the circular storytelling of office gossip. There are incidents that are hilarious (one involving a office chair), puzzling (such as old Brizz leaving Benny a massive totem pole in his will), disturbing (a certain office visit by Tom after he is let go), and sad (the death of a child, breast cancer) - all told in that breathy "Have you heard about..." tone so prevalent around the water cooler. I really enjoyed reading this debut novel (there are even some fun ad campaigns interspersed) and look forward to more from Ferris.